...with some French vibes. Or no? Can't get over the feeling that today's outfit has this little French touch. Maybe it's due to the striped jumper that keeps provoking these associations in my mind. Seriously, every time I wear it it makes me feel a little Parisian and turns my Eastern European city into little Paris... Or maybe it's due to that red touch brought by lipstick and super cool sunglasses. Or, actually, it's a combination of both that turns the look into modern French much. 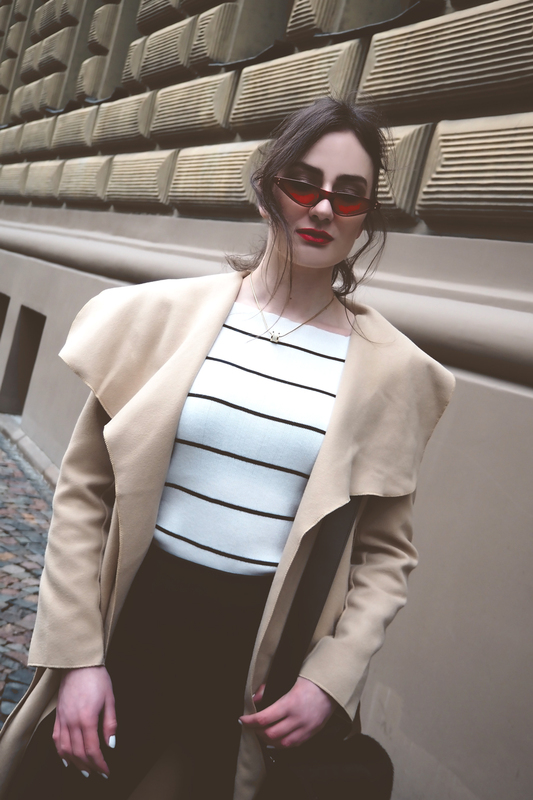 Speaking of the red shades and why I went for such a choice... here everything is pretty simple, at some point, I mean in the end of winter, I decided I need some red color for spring/summer season in my fashion arsenal. And I thought that sunglasses must be a great idea. So I started searching and found this style. I adore everything about it - the design, the shade (not too bright yet not too dark) and the fact it matches a wide range of my outfits.